Castles come in all shapes and sizes, and range from those intended primarily to offer comfort or prestige to their residents, to those whose only aim in life is to offer uncompromising protection and defence. 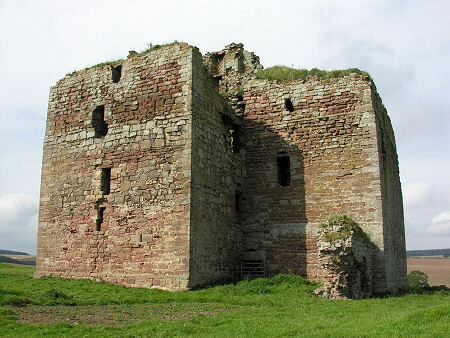 Cessford Castle lies some six miles south of Kelso, and similar distances north east of Jedburgh and west of Yetholm. Morebattle is just two miles away. Perhaps more significantly, it lies within eight miles of the border with England: one of the most troubled borders in Europe for over 500 years. It comes as no surprise to find that Cessford Castle is a brutal and massive edifice clearly designed above all else to offer protection against everything up to and including a full scale siege. 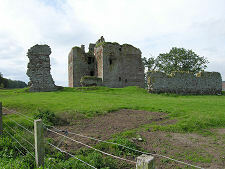 A great deal of work has been done in recent years to consolidate the remains of Cessford Castle. 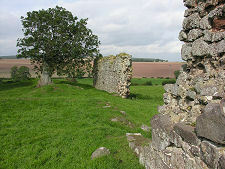 The crack that previously split the south west corner from top to bottom has been partly filled in; the trees growing out of the wallheads have been removed; and all the exterior stonework has been made safe. The interior is another story. The information boards outside the castle warn against entering it. This is very good advice. Fresh looking stones on what now serves as the floor of the castle show that the interior stonework cannot be relied on not to fall on your head if you do venture inside. 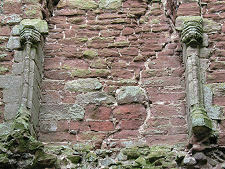 Most of what you see at Cessford Castle today was the work of the Ker family, ancestors of the current Dukes of Roxburghe, in the years after 1450. It is clear from the exterior stonework that the castle was not built in a single phase and there is a suggestion that an earlier castle, or earlier phase of this castle, may have stood here at the time of Robert II's death in 1390. 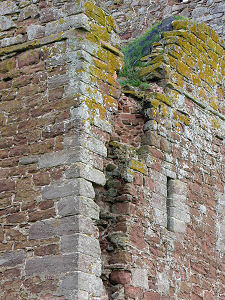 A sense of the sheer brutal power of Cessford Castle can be gained from the thickness of its walls, visible from the exterior via various openings. The walls range from 12ft to 13ft 6in thick. 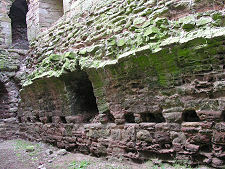 This means that the walls themselves consume over half the total width of the keep of the castle and over a third of its length. The castle is "L" shaped. The keep is aligned north-south, and a bulky wing is attached to the south end of the east side of it. Within the keep were two vaulted levels (the vaults are long gone). The lower had an entresol or mezzanine floor of wood, as evidenced by the joist holes in the side walls. 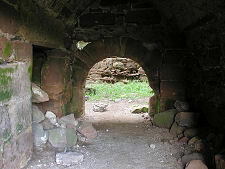 The lower vault would have provided two levels of storage, while the upper vault held the great hall. 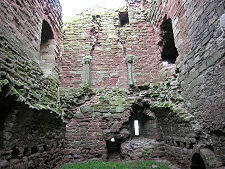 Much of the accommodation within the castle was contained in the wing. This comprised six storeys, ranging from the pit prison at the bottom up through guardroom, kitchen, and three levels of family chambers. 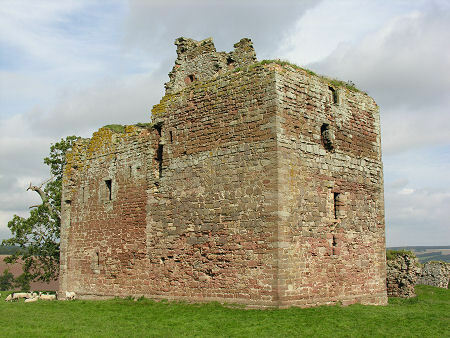 In times of trouble, Cessford Castle could accommodate the Ker family and their servants and retainers, including a garrison of 60 troops. Most of these would have been accommodated outside the main block of the castle itself, in a courtyard area surrounded by a barmkin wall. Two pieces of this wall remain, with one carrying joist holes to suggest that a building was erected against it. 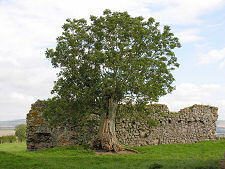 Some have suggested that most of the courtyard was surrounded by an earth bank and ditch rather than a stone wall. A record of a siege by the English in May 1523, in which scaling ladders were needed to gain access to the courtyard, suggests that the wall whose remains you see today did once enclose the castle. And Cessford Castle certainly saw more than its fair share of action. The siege by the English Earl of Surrey in 1523 (the man who had defeated the Scots at the Battle of Flodden just 10 years earlier), was just one incident of many. On this occasion Cessford successfully held out against English artillery until the defenders negotiated its surrender and their safe passage. The castle was again attacked by the English in 1545, during Henry VIII's campaign of "rough wooing" (see our Historical Timeline). And it was not just the English that the Kers had to protect themselves against. 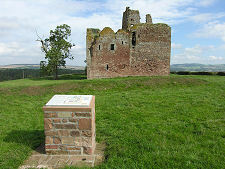 Through much of the 1500s the Kers of Cessford conducted a bitter feud with the Scotts of Buccleuch. During this time, members of both families were killed by the other, and in 1548 the Kers burned down Catslack Tower near Selkirk. Among those killed was Elizabeth Scott, Buccleuch's widow, who had been born a Ker of Cessford. In 1607 Sir Robert Ker, later the 1st Earl of Roxburghe, abandoned Cessford Castle for more comfortable accommodation near Melrose. His great, great grandson, the 5th Earl of Roxburghe, moved the family to what is now Floors Castle near Kelso: a castle as far away from Cessford on the "defence or comfort" scale as it is possible to get. Near the hamlet of Cessford. Very limited parking. Exterior consolidated and info boards provided. The interior is dangerous: view externally only.